Alleluia! Jesus Christ has risen, He has risen indeed! Let us give thanks to the Lord, for He is good and His mercy endures forever! with peace, happiness and success always! 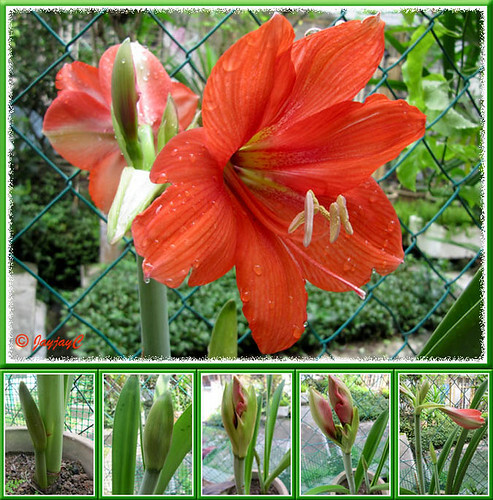 Our backyard garden became alive and vibrant too with the Hippeastrums or Barbados Lilies flowering in full swing for the Easter Season. Wow! A bear-hug and a big thank you to Annette Pang for presenting us with 2 bulbs in August 2008. Flowering for the first time in nearly 2 years, these brilliant scarlet-coloured Hippeastrum are such warmers for our hearts and soul! So wonderfully uplifting too that both bulbs decided to wake up from deep slumber to bloom almost around the same time. Hence, we got to enjoy their flowers for almost a month, the last one will probably close shyly in a day or two! What a joyful extended sight! Praise and thank God! Flowers are large, about 5 inches across and about the same in depth. The width between opposite ends of two flowers is almost a foot across…awesome! The first 24-inch tall flowering scape was crowned with 4 fabulous blooms while the second stalk, a wee bit shorter had 2. I was truly mesmerized by the whole blooming event and captured countless photos to enjoy further on our iMac! Sharing more images here to delight you…enjoy! Another delightful Hippeastrum that never fail to cheer us around Easter Season is the commonly grown salmon-colored Hippies. They’re so reliable and hardy. It was no surprise at all when the salmon-coloured hippies started to spring buds from mid-March. That’s their usual stunt, appearing before or after Easter. But, what truly pleased us was the pot-bound bulbs continued to churn out the most flowering scape this season, last count was eight scape with four flowers each and the final flowering stalk just burst with blooms today! How lovely, we got to enjoy them for nearly one and a half months. Observed that the flowers were a tad smaller this time around, probably bulbs are congested and crying for space. We intend to reduce its number and repot soon. 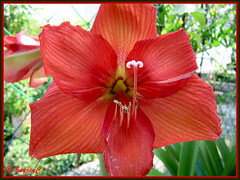 Check here for more plant info on Hippeastrum hybrids. 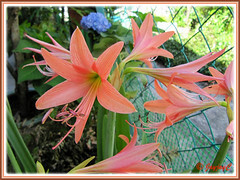 Caribbean Spiderlily, another Easter 2009 garden surprise! Wow, your Barbados Lilies are really beautiful. I just love the orange-red colour. I didn’t know we can grow such lovely lilies here. I just bought some salmon hippies. Thanks, Autumn Belle! May your salmon hippies bring much joy to you too with their bountiful blooms. I would really consider that as something very significant when these glorious RED flowers blooming on Easter. Truly with a double bonus with the salmon hippies! Surely these are really a resurrection moments. This Barbados Lily that you have shown, it goes by another name too, right? 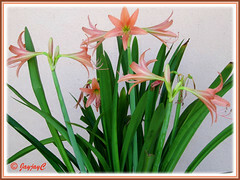 It is also know as Amaryllis or Belladonna Lily and sometimes naked ladies. They have it in wikipedia, sorry if I had intruded and sounded rather rude. I have them in my garden too, my variety is all red and I have nearly 20 plants. all in pots, big and small. Yes, indeed, truthfully, the flowers are very eye catching, everytime they bloom, walkers around the garden will surely stop and oh-ah at the blooms. I do have many experiences in growing them and have found out some of their habits, if you like, I can always share them. Indeed, James…a truly momentous event for John and I, such rapture! Thanks for dropping by, dear friend! Not to worry, no offence taken at all…after all, we’re here to learn from one another, yes? 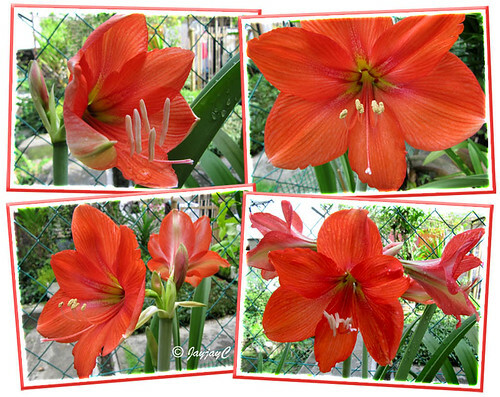 Nonetheless, I beg to differ – Barbados Lily or Hippeastrum is not Amaryllis or Belladona Lily, though usually confused by many. 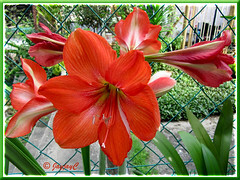 Read about the difference at PlantIdeas.com which stated that Hippeastrum has a hollow flowering stalk, while the latter has a solid one. I’m accepting your offer of sharing info. Since you have much experience in growing Hippeastrums (I assume that’s what you have…wow, 20 plants and all red!! ), I’d appreciate if you can share more on their culture at our related article on Hippies profile by posting a comment there. Much thanks in advance.